By Keith Cowing on February 28, 2005 8:02 PM. "Investigators have been advised that as many as 21,000 NASA employees could potentially be involved in this matter. Bank of America has begun the process of sending letters to each person affected. Those letters should arrive sometime this week and will provide an update and a special toll free number for cardholders should they have questions or concerns." By Keith Cowing on February 28, 2005 7:39 PM. Editor's note: I noticed a rather curious disclaimer at the the bottom of this article this morning on the Space Review: "Dwayne A. Day served as an investigator for the Columbia Accident Investigation Board (CAIB). He currently works in the space policy field for an organization in Washington, DC. This article represents the opinions of the author alone." That's fine, but I find it curious that Mr. Day sees fit to identify an organization he no longer works for - but won't name the 'space policy organization' he currently works for. By Keith Cowing on February 28, 2005 11:40 AM. "Retired NBC reporter Fred Francis, a NASA consultant, says, "After 38 years as a journalist, I wish I had the talent of an AP reporter from Baton Rouge who was able to get four unnamed sources in Washington to trash someone. The story was just flat wrong." By Keith Cowing on February 24, 2005 10:32 AM. "Maj. Robert H. Lawrence, Americas first black astronaut, had already traveled far by the time he was selected as a military astronaut in 1967. His death later that year in a tragic accident not only cut short a promising career, it led full recognition of his accomplishments and hard-won status to be obscured for decades. Only after his supporters traveled their own difficult journey was Lawrence accorded his proper place in space history." By Keith Cowing on February 23, 2005 12:35 PM. "This unique event includes registration, booth spaces, advertising of NASA carer opportunites, and other relates services." Editor's note: Wow, I am sure NASA is making a great impression upon these students with these quasi-literate, typo-laden procurement postings. By Keith Cowing on February 21, 2005 6:00 PM. "Four NASA officials, insisting on anonymity, have told the Associated Press that the Government Accountability Office is looking at O'Keefe's travel practices, including his use of government planes, as part of a wide-ranging look at the space agency's finances under his tenure." Editor's note: Either this reporter (Adam Nossiter) is sloppy or he doesn't read the news. In the article below (also on Nola.com but not mentioned by Nossiter) GAO officials have already provided a picture of what they are actually investigating. Yet Nossiter is still pushing his view that this whole thing is focused on O'Keefe's travel practices when GAO says that this is not the focus of their audit. "Auditor Geoff Frank said the congressionally requested probe does not target O'Keefe, but is a broad look at the internal controls the space agency used to ensure employee travel was justified. "It certainly doesn't focus on him," said Frank, an assistant director at the Government Accountability Office. "To the extent he was traveling, we could look at that. We're in the very early stages. We haven't concluded anything about Mr. O'Keefe or anyone else." "Let's start touting Glenn's critical role in exploration. An aggressive, coordinated, sustained campaign must be mounted by the Ohio congressional delegation, with support from academia and industry and in close consort with Glenn management, in support of Glenn's leadership exploration role. Cut 700 people? Irresponsible. If we want to start exploring the moon and Mars, Glenn needs at least 700 more!" By Keith Cowing on February 20, 2005 1:31 PM. "John Pike, a government watchdog and security expert who runs GlobalSecurity.com, said earlier this month the president's space exploration plan "is just a way to kill NASA." ... "Pike said the White House has no love for the space agency and would like to see it "go away." Editor's note: There are only two words to describe Pike's comments in this article: stupid and unsubstantiated. By Keith Cowing on February 18, 2005 8:46 AM. "The investigative office of Congress is examining Sean O'Keefe's work as administrator of NASA, including whether he misused government airplanes and went on too many expensive getaways with subordinates, former and current senior NASA officials have said." "To the extent there is such a thing [investigation] under way, it will validate and confirm that my entire public service as a financial manager has been responsible," said O'Keefe, who begins a new job as chancellor of Louisiana State University on Monday." Looks like I am being "watched"
By Keith Cowing on February 16, 2005 11:40 AM. Editor's note: it would seem that some folks don't like the way I have been running NASA Watch recently. I got this from Derek3B@aol.com today "We're watching you, and we're bigger and stronger and more pervasive than you think. And if you're not careful, the events surrounding your departure from NASA will see the light of day. So far I am not stooping that low." Continue reading Looks like I am being "watched". By Keith Cowing on February 15, 2005 10:21 PM. Editor's note:Earlier this evening word was rushing around Washington, DC, the media, and Capitol Hill that the President would make an announcement Wednesday morning around 10:00 am that he intends to nominate Dan Crippen to be the next Administrator of NASA. Soon, reporters were calling Congressional staffers and staffers were calling reporters to pass on what they heard and to see what they knew about Crippen. Feedback loops soon began to form with people breathing their own fumes. Update: White House sources now say that there are no current plans to make an announcement about the NASA Administrator nominee tomorrow. Moreover, the traditional pre-announcement briefings on the Hill have not happened yet. It would seem that one reporter from a prominent space publication, citing NASA HQ sources, whipped up this feeding frenzy by calling all over town. Lastly, it would seem that the suggestion that the nominee is Dan Crippen may be somewhat premature. By Keith Cowing on February 14, 2005 11:51 AM. Editor's note: Everyone calm down. We'll all know soon enough - very, very soon, as a matter of fact. By Keith Cowing on February 14, 2005 1:14 AM. "A large black ball, originally designed by Swedish scientists for use on Mars, could be the latest weapon in the war against burglars." By Keith Cowing on February 11, 2005 3:32 PM. 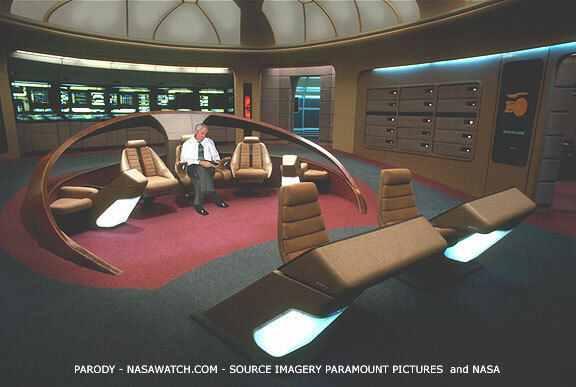 Editor's note: As was seen at today's farewell for Sean O'Keefe on NASA TV, it would seem that O'Keefe really got carried away when he redecorated his office at NASA Headquarters recently. By Keith Cowing on February 11, 2005 9:24 AM. "You are invited to hear Administrator Sean O'Keefe deliver farewell remarks to the NASA Family live from the Headquarters auditorium at 2 p.m. Friday, Feb. 11, and to attend a reception afterwards in the Administrator's suite on the 9th floor. The Administrator's remarks will also be broadcast live on NASA TV (HQ Channel 3) and on the Web at http://www.nasa.gov/ntv. Please join us for this special occasion." By Keith Cowing on February 10, 2005 10:02 PM. "Of course, there may be another reason for this move -- Fred Gregory is black, and this administration (as we know by now) is very fond of utilizing a thin facade composed of the very small coterie of nonwhites who support it, in order to cover up its Simon Legree-ish actual policies." To publicly assert such motives on the part of the White House or to imply that Fred Gregory would be a willing participant is utterly reprehensible. If Mr. Moomaw has a shred of decency he will apologize - immediately. 15 Feb 2005: I got a long message on my voicemail from Simon Mansfield, the editor of Space Daily.com this afternoon. In among a long slew of insults and repeated suggestions that I was not professional (certainly a curious way to make that point), was his assertion that neither he or his website has anything to do with Mr. Moomaw's comments. For the record let me state that I have no evidence that his assertion is incorrect. Simon is not that kind of person. Anyone who draws such an inference from my original post would be incorrect in so doing. However, for purposes of identifying what Mr. Moomaw does for a living as an author, it is certainly true to say that Mr. Moomaw is "a regular contributor to SpaceDaily.com and occassional writer for Astronomy Magazine." By Keith Cowing on February 5, 2005 7:50 PM. Editor's note:The past few weeks have been relatively quiet with regard to the effort to replace Sean O'Keefe. Nothing has leaked out of the White House (with any veracity that is) as to names actually under consideration other than the fact that Michael P. Jackson was under serious consideration for the job until he took the number two position at Homeland Security. Weeks ago, a number of people were making it known that they would be interested in the job of NASA Administrator - if offered. Others went further and tried to circulate their names such that the White House would take notice of their interest - and perhaps act on it. At the present time, however, the name of only one individual who openly expresses interest (and is also seeking) the job is circulating: Michael Griffin. Griffin has made his interest in the job of NASA Administrator known in Washington area and, more recently, at the AIAA Space Exploration Conference in Orlando. Griffin, of course, is no stranger to exploration and has offered many interesting and innovative ideas on the topic over the years. As to what names are (or were) on the actual list with which the Administration has been using to make its decision, only an exceptionally small number of people truly know. Indeed, many people in and around the White House who think they know who is on the list - actually don't know - or the list they are looking at is not the real list. We'll all know soon enough, now won't we - and word of a choice may still surprise people. Just remember: the last time a NASA Adminstrator was chosen by this President it was an out of left field, last-minute choice: Sean O'Keefe. It ain't over 'til it is over, folks. By Keith Cowing on February 3, 2005 11:28 PM. Editor's note: According to various NASA JSC sources, a former JSC Deputy Director doesn't like one particular possible candidate for NASA Administrator and is mounting a campaign against this person including encouraging arm waving phone calls to the White House. By Keith Cowing on February 1, 2005 10:47 AM. NASA Watch has learned that the Jupiter Icy Moons Orbiter (JIMO) mission will be delayed. Details will be announced Monday, February 7th during the roll out of the FY06 NASA budget submission. By Keith Cowing on February 1, 2005 7:33 AM. "An electrical short in a neon sign is being blamed for an early morning blaze today that caused $15,000 worth of damage to a popular bar and grill frequented by NASA employees." Reader Update: "This is an update on the Outpost Tavern fire story you posted Friday. . ."
Continue reading Favorite Dive Damaged by Fire. This page is an archive of entries in the News category from February 2005. News: January 2005 is the previous archive. News: March 2005 is the next archive.